Well, the results of the Hall of Fame balloting were revealed on Wednesday, and it appears as if Bert will be Cooperstown bound Blyleven (as in 2011). The best eligible player not in the Hall received 400 votes, good for 74.2% of the 539 ballots cast. He missed out by 0.8% of the 75% threshold needed for induction. I first learned that Blyleven fell five votes short of election in an email from Bert minutes before Jeff Idelson, president of the National Baseball Hall of Fame and Museum, announced in "one of the closest votes in history" that Andre Dawson would join Veterans Committee selections Whitey Herzog and Doug Harvey as the Hall of Fame class of 2010 on July 25 in Cooperstown, New York. In a subsequent telephone conversation, Bert told me that he received a phone call from Brad Horn, director of communications of the National Baseball Hall of Fame and Museum, five minutes before the results were announced. Thinking this may have been the call that every Hall of Fame candidate dreams of, Bert was holding hands with his wife Gayle when Horn told him that he missed out by five votes. Blyleven laughingly said, "You've got to be kidding me, right?" Turns out it wasn't a joke or one of his friends pulling a prank on him. I initiated the email thread that morning when I sent Bert the latest update on the Hall of Fame balloting as compiled by Repoz, the editor-in-chief of the Baseball Think Factory. Based on 125 full ballots, Blyleven was at 80.0%. I told him: "I thought it was a 1-in-3 shot this year but am now thinking 50-50 with 99.9% certainty next year (if not this year). It's gonna happen, either this time around or next time around. You deserve it, and I'm very happy for you. It's been too long of a wait already. I hope it's just a matter of an hour or so now." As it turned out, it looks as if it will be at least 8,760 more hours before Bert is rightfully elected to the Hall of Fame. The good news is that his election is no longer a matter of if but when. We only need to round up five more votes. These needed votes could come from Carrie Muskat, Mark Newman, and Marty Noble at MLB.com and Pedro Gomez, Tony Jackson, and Michael Knisley at ESPN.com. Or from any of the other 133 writers who voted "no." Maybe Jay Mariotti, assuming he is still a member of the BBWAA next year, will vote for Blyleven once again rather than turning in a blank ballot. Perhaps Murray Chass will reconsider his position, putting into proper perspective Bert's 10-17 record at the age of 38 when he "pitched with a sore shoulder all season long." Heck, maybe Buster Olney and Jon Heyman, both of whom have never voted for Blyleven based on their belief (here and here, respectively) that he wasn't a "dominant" pitcher, will check out the following table and recognize that he was indeed the dominant pitcher during a large portion of the 1970s. Bert led the majors in Runs Saved Above Average (RSAA) for FOUR CONSECUTIVE FIVE-YEAR PERIODS beginning in 1971-1975 and ending in 1974-1978. RSAA was created by Lee Sinins of the Complete Baseball Encyclopedia. It measures the number of runs that a pitcher saves his team relative to the number of runs that an average pitcher in the league would allow over the same number of innings, adjusted for ballpark effects. The beauty of RSAA is that it combines quality (runs saved per inning vs. the league average) and quantity (innings pitched). Over the past 50 years, the five-year leaders have included Don Drysdale (1x), Sandy Koufax (3x), Juan Marichal (2x), Bob Gibson (2x), Tom Seaver (2x), Bert Blyleven (4x), Jim Palmer (1x), Steve Carlton (3x), Dave Stieb (5x), Roger Clemens (7x), Greg Maddux (5x), Pedro Martinez (4x), Randy Johnson (2x), Johan Santana (3x), and Roy Halladay (1x). While it may be too early to judge Santana and Halladay, 11 of the other 12 pitchers are either enshrined or will be enshrined (including several "inner circle" Hall of Famers). The only exception is Stieb, whose HOF case was derailed by a relatively short career. Note: You can access the complete list of leaders since 1900 here. Bert Blyleven ranks fifth in career strikeouts, ninth in career shutouts, and in the top 20 since 1900 in wins. Every eligible pitcher with 3,000 strikeouts is in the Hall of Fame except Blyleven, who has 3,701. Every eligible pitcher with 50 shutouts is in the Hall of Fame except Blyleven, who has 60. Every eligible pitcher in the top 20 in wins since 1900 is in the Hall of Fame except Blyleven and Tommy John. For those who might wonder why Blyleven and not John, please be aware that Bert struck out 1,456 more batters, pitched 14 more shutouts, and had a superior K/BB (2.80 vs. 1.78), WHIP (1.20 vs. 1.28), and ERA+ (118 vs. 110). Be it RSAA, strikeouts, shutouts, or the fact that he completed fifteen 1-0 shutout victories (the third-most ever and the highest total in 75 years), Blyleven was clearly a dominant pitcher. He should have been voted into Cooperstown a long, long time ago. It would defame the Hall if Blyleven weren't elected in one of his two final years of eligibility. Meanwhile, here's hoping that the same 400 writers who voted for him this year mark an "X" next to his name again *and* at least five additional writers step up and support his candidacy in 2011. With the help of long-time advocates such as Jim Caple, Jay Jaffe, Rob Neyer, Dayn Perry, Joe Posnanski, and Joe Sheehan, I believe we can convince a number of voters who have either been on the fence in the past or may not have taken the time to understand and appreciate Blyleven's qualifications. These newbies can join the ranks of converts like Caple himself, Bill Conlin, Jerry Crasnick, Peter Gammons, Bob Klapisch, Jeff Peek, Tracy Ringolsby, Ken Rosenthal, T.R. 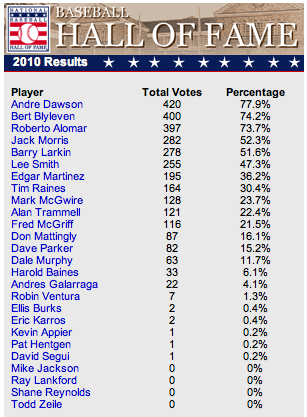 Sullivan (and many, many others), all of whom began to vote for Blyleven at some point during the past seven years. As they say, "If you can't beat them, join them." For added measure, you'll be on the winning side next time around. Thanks for all your work on this. The end is near. I know this may be heresy for some, but instead of all the comparisons to Morris, I think Nolan Ryan is a more apt comparison. Writers criticize Blyleven's winning percentage. It's better than Ryan's. Writers point to the lack of "dominant" seasons. Ryan had two 20+ win seasons and two 19 win seasons (all early in his career). After that, his record is filled with 10-16 win seasons (usually with double digit losses). Ryan was always thought of as "dominant"--the speed, the strikeouts, and the no-hitters, and in any given game, he could be simply amazing. But his career "results", under old school (W-L, ERA) terms, are very similar to Blyleven's. Without pitching well into his 40s, Ryan wouldn't even have had the magical 300 wins. And while Blyleven doesn't have the no-hitters, he matches Ryan with shutouts. Ryan may have had better "stuff", but Ryan's 2,795 walks are the great neutralizer. I know you know all of this (and have probably written it already), but the same guys who put Ryan in on the first ballot should be able to see this. Emphasis on "should." Does this new stat mean we'll be electing Dave Stieb to the hall next? Great chart! Amazing to see how long Blyleven was the best pitcher. Also interesting to see Stieb's name show up so often, though with some fairly low numbers on the front and back end of his dominance. So, what happened to Blyleven during his prime? People want to talk about how good he was in the early to mid-70s, but by 77 he was just entering his late 20s. What about his time with the Pirates, when he was on good offensive teams (1978, 1979, 1980) but didn't perform well? Was he having arm problems? Dave Stieb was an excellent pitcher with a fringe HOF case, which is more than I can say for Jack Morris. I had a feeling that somebody was going to bring up Stieb in that manner. So silly. Stieb's inclusion on the rolling five-year RSAA leaders in no way minimizes Blyleven's greatness. Blyleven is aligned with 11 out of 12 Hall of Famers and you bring up Stieb, who just so happened to be a damn good pitcher. He was every bit as good as Morris, if not better, during the 1980s, yet was a one and done HOF candidate while Jack is polling over 50%. For that particular decade, which is the one Morris supporters like to quote, Stieb had the best ERA and was number one in shutouts and second in wins. He almost threw back-to-back no-hitters (both broken up with two out in the ninth) in 1988. He tossed three one-hitters that season and three in four starts at the end of '88 and the beginning of '89. He also threw a no-no in 1990. Over the course of his career, Stieb was 176-137 with a 3.44 ERA and a 122 ERA+. He ranks 67th in WAR and is a member of the Hall of Merit. While I'm not advocating Stieb, he would be a better choice than 8-10 current HOFers. If you expect this argument to win any new votes, most of the anti-abstract crowd will have bailed from your long-winded piece well before the dumbed down stats might help persuade them. Missing by 5 votes is the cruelest irony. It's like deja vu all over again for Bert. Think of it as an L on his record for being on the wrong end of a 1-0 or 2-1 game. First of all, I think your argument is weakened when you assume anyone who has a problem with the new stat is anti-stats or anti-Blyleven. I am not anti-Blyleven and I am not pro-Stieb or pro-Morris (though I agree that Stieb was the better of the two. And, I really have no problem with Blyleven getting elected, as he obviously will now. But all of the cases I see that support Blyleven rely heavily on the early part of his career to present his dominance and make no explanation of his lack of effectiveness during his prime. I do not think comparing him to other borderline HOF players or players who shouldn't even be in the hall strengthens his case. Making the hall more mediocre doesn't fix the problem. While I agree with a lot of what you are saying about writers like Shaughnessy and Heyman not using stats to back up their arguments, I do wonder why Bert was not considered better in his prime by writers who watched him play. I know Cy Young awards are largely based on wins, but Blyleven got virtually no votes, meaning most writers didn't even consider him in the top 7 or 8 pitchers in his own league in any given season. I am not advocating that Blyleven shouldn't be in. But I do consider his case borderline when you look at his contemporaries, his whole career, and teams he played on. So why do the candidates get such a big surge of support as they get closer towards 75%? I think it is because (some of) the writers are so full of themselves that they want to be able to say "I voted for him" on the year a player finally makes it. You know, so they can feel like a winner and like they are an awesome person. So even if the Heymans and Olenys keep on ignoring Bert, some of these writers who did not vote for Bert this year will change their vote next year, even if it is only to be on the winning side. @John Cook: I never stated that you were anti-stats or anti-Blyleven. You're the one who brought up Stieb in a snarky manner. I responded by pointing out that Stieb was a pretty good pitcher in his own right and reminded you that Blyleven was aligned with 11 other Hall of Famers. If you want to make a big deal out of the "B" on your kid's report card when all of the other grades are "A," that's your choice. With respect to the second half of Blyleven's career, one could say he resembled Jack Morris. While Morris had a slightly better W-L % (.577 vs. .554), Blyleven had a superior ERA (3.73 vs. 3.90), ERA+ (109 vs. 105), WHIP (1.25 vs. 1.30), and K/BB (2.55 vs. 1.78). Blyleven also had a better postseason record (5-1, 2.47 ERA, 1.08 WHIP, 4.50 K/BB) than Morris (7-4, 3.80, 1.25, and 2.00) and his postseason was achieved during this time frame. I'm not picking on Morris. Instead, I'm only pointing out that Blyleven was a truly dominant pitcher during the 1970s (as shown by the rolling five-year RSAA leaders) and at least the equal of Morris after that. when blylevin gets in next year, you should be the first person he thanks (after his parents) because he would either have dropped off the ballotr or be around his old 20 something percent if it wasn't for your advocacy and tireless hard work on his behalf. You may have considered my Stieb comments snarky, but I really didn't intend them that way. I was genuinely curious if you were going to make a case for Stieb, since Blyleven's election is now a foregone conclusion. You are right about the anti-stats, anti-Blyleven thing. That was really more implied by Jack Haas's comments. As far as Blyleven's case for the hall, I don't have a problem with him getting in, but I do have a problem understanding why more people who covered him aren't advocates. Guys like Rice and Dawson have legions of supporters despite stats because they were perceived as being great in their prime. It seems to me the writers of that time didn't consider Blyleven a top AL pitcher, though the stats seem to indicate he was. Also, my concern about where we are headed now is that we seem to have 2 camps: stats-guys and perception-guys and each seem to be pushing hard for their own candidates. As such, we're likely to have a lot of borderline candidates from both sides getting in. While I admire your campaign to get Bert elected (and I do think he deserves to be there), I think campaigning for HOFers is dangerous because a guy with weak HOF stats (a la Morris) can be argued as strenuously as a guy with stronger stats (a la Blyleven). Lastly, if you look at the full RSAA list, there are a lot of guys on it who either aren't in the hall of fame (and shouldn't be, such as Mel Parnell and Frank Sullivan) or are in the hall and shouldn't be (such as Drysdale). Keep up the good work Rich! One more year! I just ask anyone unconvinced about Blyleven to look at this list of the only nine pitchers with 4500 innings and a career ERA 18% better than their peers. To answer your question regarding lack of legions of supporters similar to Rice or Dawson, I think the likely answer is the difference in judging pitchers compared to hitters. A batter can have several bad games and it blurs into a 150+ game season. A bad game for a batter is 4 or 5 at bats. A bad game for a pitcher is maybe 20 - 30 at bats (or batters faced). A pitcher can do well and have it all (in some peoples vision) be for naught when the 2 run lead is lost by the bullpen. Ten years later it isn't remembered that a hitter hit a few of his home runs during games he and his teammates end up losing. A pitcher is held to account for matters outside his control - winning percentage. My own belief is winning percentage usually ends up close to matching performance. However, with any uncontrollable statistic there will be outliers. Ryan and Blyleven clearly pitcher better than their win percentage. Morris and Drysdale likely had a better winning percentage than their performance would be expected to equal. With tens of thousands of pitchers in baseball history probably 90% are close to matching. The rest are off their winning percentage by varying degrees. Statistics can tell you about the norm but can not deal with outliers. I think its the "stat" guys that don't get it. Blyleven was a great accumulator of stats, not a great pitcher and his career and his WAR, RSAA, VORP or whatever indicates exactly that. He was an all star exactly twice. Twice! How can you be considered among the greatest players ever when you were only considered among the best of your league during two different seasons? He garnered Cy Young votes 4 times in 22 years! That means that only 4 times did cy young voters even think he was the 3rd best pitcher in his league over the course of a season. Sorry; those "stats" mean more to me than 3700 Ks. He only ever led his league in strikeouts one time and averaged 6.7 Ks/9 innings. Not exactly a dominant force of strikeouts, more like a guy who pitched forever, threw a ton of innings each year, never got hurt and was very durable. Does that mean Hall of Fame? I don't think so. "So, what happened to Blyleven during his prime? People want to talk about how good he was in the early to mid-70s, but by 77 he was just entering his late 20s." What happen to Nolan Ryan after he hit age 30? From age 31 to 40 he was a "mediocre" 120-110. His largest win total was 16. And the Astros had some good years in the 80s--i.e., 1980 and 1986. But Ryan had only 23 wins combined in those two years. It isn't hard to see that these are silly arguments, when applied to Ryan or Blyleven. They were both great pitchers. One's a bit overrated (note the many fans who rate Ryan as one of the top 5 pitchers of all time). One's underrated (note the 13 years of HOF ballots). Thankfully these arguments should end next year. I don't think all-star games and Cy Young votes mean that much. It could have been a mistake that he was not picked for more games. Remember that each team has to have one rep. The Twins often had Carew at the game, so it reduced the need to pick Blyleven. Some inferior pitchers might have been picked over Blyleven because other teams needed to have a rep.
And only 3 guys get named on the Cy Young ballot. So that reduces the chances and it is the writers anyway, who could have been making the same mistake they are making now. On RSAA, he finished in he top 10 12 times and in the top 5 8 times. For strikeout-to-walk ratio, he had 12 top 5 and 14 top 10 finishes. He had 6 top 3 finishes in RCAA. So he should have gotten alot of Cy Young votes. Again, maybe the writers made a mistake. He also finished in the top 3 in strikeout-to-walk ratio 7 times. Twice he finished in the top 3 in both stats. The Parnell/Sullivan (and also Stieb) comparisons are off-point. The five-year RSAA numbers show that, using a relatively straightforward metric for the period in question, the named pitcher was the best -- or at least among the best -- pitchers in baseball. In Blyleven's case, this is relevant to the criticism that goes, "Well, he may have pitched for a long while and compiled some impressive numbers, but he was never one of the top pitchers in baseball." The important point is that it is conceded by all that Blyleven's career numbers are HOF-worthy. The same obviously cannot be said of the other pitchers. If, however, Parnell (for example) had lifetime stats similar to Blyleven's, in my opinion he'd be a no-brainer for the HOF, irrespective of how many All-Star games he appeared in. Hey Rich - I'm not sure that you can call Blyleven the "best eligible player not in the Hall" anymore ... Blyleven was probably #1 for the last 13 years, though, I'd give that honor to Robbie Alomar for the next 12 months. I was excited to see such a big jump in his support this year. I initially thought he'd have to wait until his final year of eligibility, though 2011 sounds good too! Rich -- you may want to read Craig Calcaterra's analysis of why Bert's induction in 2011 isn't a foregone conclusion. Regarding the low win percentage argument - I argued initially on another blog that maybe the argument should be taken a (little) bit more seriously than his advocates would allow. After some research, I concluded that the argument was indeed (mostly) bogus. But the simple dismissal of the argument - a blanket assertion that pitcher win/loss records are irrelevant to evaluating their effectiveness, combined with the (false) claim that he got lousy run support from his teams (his run support was very close to average overall - less than 1/10 of a run below league average per game) - doesn't convince anyone. That said, here's hoping he makes it next year. Regarding the Craig Calcaterra link, you would think that someone would go to baseball-reference.com and you know, look at the data. It does show a small decline in performance in late/close situations, but probably no more than the average pitcher (because starters tire late in the game). So it isn't a legitimate knock on Blyleven. Interestingly, though, (not that this matters in the big picture sense), some of his early "curious" yearly win loss records (near .500 despite great run prevention and average support e.g., 1972, 1977) can indeed be partially explained by some poor yearly late/close numbers. But that evens out over the career, and thus doesn't diminish his accomplishments. If Bert Blyleven gets in the Hall, it will a triumph for manipulated statistics and shameless promotion. He didn't get in when first eligable for a reason, good pitcher, just not a HoFer. Be honest, no one ever said with the game on the line, "I wish Bert was in there!" What do you do after Bert, start your Dave Steibe campaign? There is another convincing argument that never gets discussed. It is largely considered that Blyleven through the best curveball of all time. So, when these clowns say he isn't dominant maybe they should ask some of the hitters he faced and ask them about Bert's curveball. Sorry Bill D but you are wrong. Someone definitely said they wanted Bert in there with the ENTIRE SEASON on the line. Game 5 of the 1979 World Series, the Pirates are down 3 games to 1 to the Orioles and losing 1-0 in the game. Blyleven comes in from the bullpen to start the 6th inning (having already pitched 6 innings in game 2 against Jim Palmer, the only game so far the Pirates have won). He finishes out the game and the Pirates go on to win games 6 and 7 and the world championship. Maybe next year when Bert is enshrined into the Hall of Fame, Jay Mariotti can be enshrined into the Hall of Stupidity. In 24.1 IP in LCS he had a 2.59 ERA. In 23 IP in World Series games he had a 2.35 ERA. His combined strikeout-to-walk ratio in LCS and WS 36-8. 1 BB was intentinal. Not to mention his win-loss record in the post season was 5-1. He pitched in 8 post season games; his [b]worst[/b] post season game was a win in which he allowed 3 ER in 6 inning pitched. But this is part of what I’m talking about. Stat oriented people shy away from citing the post season numbers – “sample size is too small to matter.” That’s misguided both substantively and in terms of persuasion. Substantively, it is a small sample – but post season games are much more important than regular season games, and small sample of no, they happened and contributed mightily to his teams' post season success. In terms of persuasion, the people left cold by analytical stats are much more likely to be persuaded by evidence of post season success. George Brett on Blyleven: "He was as good as there was for a long time. Bert is up there with the toughest four or five guys I faced in my career. The writers never had to face him. If they did, they'd vote for him." I continue to maintain that it's all about the curveball. Ryan got in on the first ballot because he was a flamethrower, and thus people "remember how overpowering he was". Blyleven is still waiting because he threw 100 curveballs a game, and thus "wasn't dominant". People respect fastballs, just as "chicks dig the long ball." Curve balls don't light up radar guns. I agree with Cyril and Larry. More emphasis should be placed on Blyleven's postseason success. That probably has the best chance of persuading any on-the fence voters. Among many other problems, here is another with those who say "someone just didn't feel like a HOFer at the time" or "someone wasn't perceived that way" or any variety of such a statement. I was between 27 and 49 during Blyleven's career, and a devoted baseball fan who watched every game I could, attended games with my children and read sports pages every day. I also knew nothing about advanced stats (until late in the 80s, and then very little). But at the time, I considered Blyleven a GREAT pitcher. That was based on my observations and my reading. Why are those who now remember him as a step below greatness more credible than I am? I admit, I make no claims to expertise or special insight, but what are we supposed to do? Poll every fan or player or reporter alive at the time to rate the pitchers? Rely on memories now at least 20 years old? Assume that the initial set of voters represent the true reputation of the man while he was active? There are sportswriters today-and fans-who don't recognize how good Chase Utley is. He has yet to rank higher than #7 in MVP voting while his teammate has won once and finished 2, 3 and 5 also. He has never won a gold glove. He has just 4 black ink entries on his record, 3 of them for being hit by pitches. Suppose this trend continues for 10 more years? Should his candidacy be ignored because his achievements were unappreciated by many while he played? Should we engage in dueling memories between those who dismissed him as less than great and those who exalted him? Or should there be a careful examination of the record to determine whether his performance puts him among the game's greats? It makes no sense to say "he didn't feel like...." or "I know a HOFer when I see one". It is the rankest arrogance to assume one's feelings represent a sufficient reason to form an opinion, especially when there are so many traces left that either validate or invalidate those "feelings", and while one may begin with those feelings or perhaps refer to them if after careful review one remains uncertain, they are at best a minuscule part of the decision process.